Martina Kudlácek’s 2002 documentary In the Mirror of Maya Deren mines an extant archive in the creation of cultural citizenship. It does so in the form of Deren “material”, weaving, layering and collaging 16mm film, audio clips, contemporary interview footage, photographs of paper-based archival material (handbills, movie posters) and the like, creating, in effect, a moving image, audio, photograph, and manuscript-based archive including, among other things: photographs of the young Elaenora Derenowksy, an emigrant from Kiev, Russia in 1917; silent 16mm black-and-white ethnographic footage of Haitian Voodoo ceremonies filmed from approximately 1947 to 1958; clips from Deren’s films Meshes of the Afternoon (1943), At Land (1944), A Study in Choreography for the Camera (1945), Ritual in Transfigured Time (1946) and The Very Eye of Night (1959); recorded interviews with Deren’s second husband (Czech cameraman) Alexander (Sasha) Hammid, as well as her third husband, Teiji Ito. Layered non-diegetically across the film is the unforgettable voice of Maya herself, painstakingly preserved. One might say it’s a voice of the archive, from the archive – and we’re lucky to hear her speak. The archive is a sub-theme running throughout the film, beginning with footage of Anthology Film Archives’ Executive Director Jonas Mekas standing in his organisation’s famous East Village, New York City archive and exhibition venue, addressing the camera, reminiscing about Deren whilst fondling spools of 16mm film. Again and again, we see the leitmotif of Deren’s archive: in “preservation” quality 16mm cans, or in Stella D’Oro coffee cans. These are used as cutaways, presumably to denote the role of the archive, the materiality of the film and the role that Kudlácek herself played in the archive while making this film (1). Kudlácek’s “author-function” was as an archivist and filmmaker while in the process of producing her film on Deren. When I ran into her at Anthology Film Archives in the spring of 2003, she said that her work on the Deren footage in the archive was an essential part of the deal she had struck enabling her to access the footage for her film on Maya (2). Kudlácek should be lauded for her willingness to engage in the extremely labour intensive practice of archival work – an activity that very few documentary filmmakers would have the patience or the wherewithal to endure. Another motif that runs across the film, although perhaps not as obviously evident, is the notion of the artist, intellectual, and/or religious or spiritual personage as a cultural citizen, another type Kudlácek sees Deren as the embodiment of. Repetition also brings the viewer, over and over, face to face (through the interview footage) with the discourse of immigration: Jonas Mekas, the Vogels, Sasha Hammid, Teiji Ito. Yet, one senses that the discourse of citizenship is as much about that of the filmmaker and her interviewees as it was about Deren and her constellation of friends, collaborators, lovers, mentors. 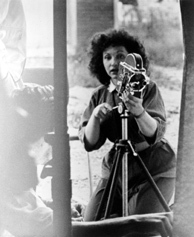 Perhaps the image in the mirror of Maya Deren is the filmmaker Kudlácek herself; but then again, identification with a “star” persona such as Deren’s is possibly one of the ways in which a documentary filmmaker can recoup symbolic capital, given the limited possibilities for remuneration offered by the documentary form, unless one is distributed by Miramax and produced by Michael Moore. In an era when classic US documentaries such as the award-winning PBS series The Eyes on the Prize are pulled from distribution because of copyright and licensing problems (3), one can only be grateful that a documentarian (such as Kudlácek) would take the time to painstakingly process – and by that I mean accessioning, cataloguing, re-housing and (at the very least) re-organising – the various strands and pieces of miscellaneous Deren footage and audio ephemera housed at Anthology. Because there is a lack of funding for archiving what are known as “orphan” films – films that do not necessarily have clear ownership for copyright purposes – artist’s estates such as those of Deren’s rely on the vicissitudinous nature of state archival funding initiatives for preservation. This has meant that films, videos, audio, and manuscripts collections falling into this category have, for the most part, been in such IP and/or preservation disrepair they’ve been unusable for production purposes. Nonetheless, Martina Kudlácek, the “author as archivist”, has not only created a new work of art, but has engaged in a feat of archival cultural citizenship that functions to preserve the Deren legacy, by bringing the work out of the archive and into the public sphere. And for those lucky enough to view this documentary in a theatrical setting, that surely is worth the price of admission alone. Deren, a noted user of central nervous system stimulants, was particularly fond of amphetamine and vitamin injections garnered from New York City Park Avenue physician-to-the-stars Max “Dr.Feelgood” Jacobson. She also, coincidentally, stored her precious reels of film footage in the cans of her favourite brand of French roast coffee. For further discussion of Deren’s tragic dependency on Jacobson’s “vitamin” injections, see Lauren Rabinovitz, Points of Resistance, University of Illinois Press, Champaign, 2003, p. 54. Kudlácek was archiving and “producing” the film and audio materials of another pioneering female American avant-garde filmmaker, Marie Menken, when I met up with her in 2003 (the same principle applied – Kudlácek would archive the footage of Menken and then have access to the materials to cut into her own film). Anthology hadn’t had an archivist on staff for seven years at that point in time. Thankfully, this was remedied later that year when archivist Andrew Lampert was hired. For further information see http://www.downhillbattle.org/eyes/. Rebecca Bachman grew up in Minneapolis. She now lives across the street from Ground Zero and attends New York University where she is a PhD student in Cinema Studies.